The BCS Championship Game isn't for another month and a half, but it looks like we all know that Alabama and Florida State will be taking part in it. So much so, in fact, that one sportsbook is already taking bets on the matchup, one that is purely hypothetical at this point. That's right, Bovada is currently offering an early line on the probably BCS title game matchup between Florida State and Alabama, with the line set at the Crimson Tide -4. If Florida State and Alabama don't end up meeting for the national championship, all bets on this will be refunded, which is even more incentive to take advantage of the fact that Alabama is only at -4. 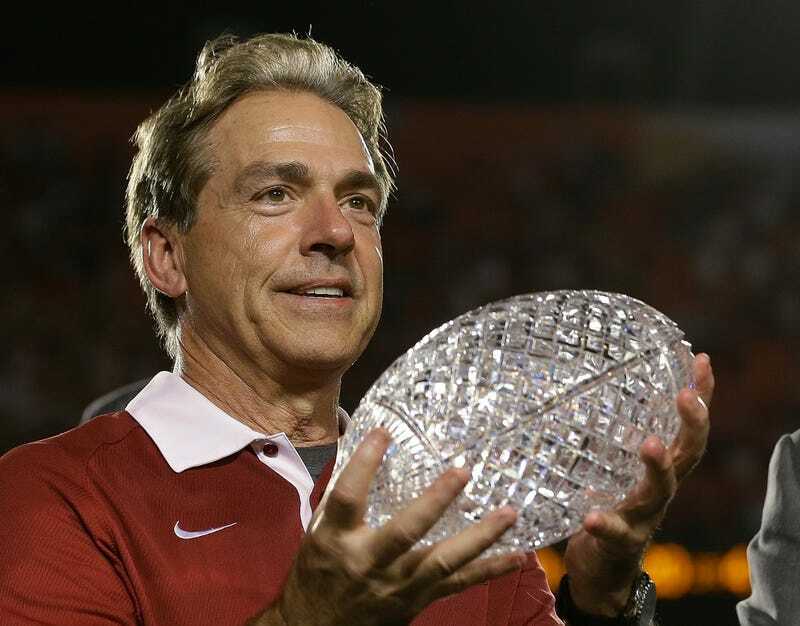 That seems too good to be true when you consider the fact that Nick Saban is prohibited by law from winning a national championship game in anything less than a blowout. Who knows, maybe Baylor and Ohio State will use this as bulletin board material, propelling them to finish the season strong and fight their way into the title game. Either way, Bama -4 sounds awfully tasty.